Citroen has added a new range of colour schemes and roof designs to celebrate the fact it has had over 100,000 orders for its DS3. A vibrant Fuchsia Pink roof colour is at the heart of the new DS3 options list - available with matching pink door mirrors, wheel centre caps, dashboard fascia and gearlever knob. 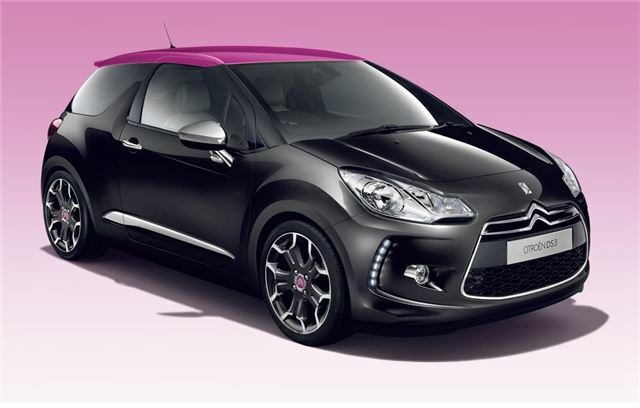 This new colour scheme is just one of a number of new personalisation options available on DS3 from July 2011. Customers can also choose a striking new Hickory Brown pearlescent body colour and two additional ‘Spirit’ roof designs - ‘Flower’ and ‘Flavio’ - to ensure they stand out from the crowd. Sales of the DS3 have grown since its launch early in 2010 and over 10,000 DS3’s have been sold in the UK alone. According to Citroen, the extensive range of personalisation options and special collections - such as DS3 by Orla Kiely - have played a key role in ensuring the model’s success.